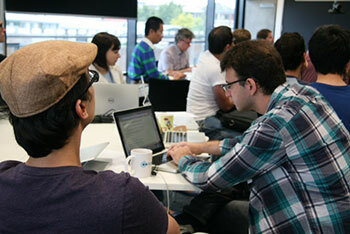 On Friday 29 November, NICTA staged its first ever ‘envirohack’, bringing together over 100 programmers, researchers and computer scientists in Brisbane, Sydney and Canberra who used some of Australia’s largest and most important environmental datasets to create fabulous environmental apps. Envirohack is one way NICTA is supporting the Spatial Information Council, the peak intergovernmental organisation for spatial information (ANZLIC) and its vision of creating a foundation spatial data framework (SDF) to provide easy access to authoritative government spatial data over the geographic extent of Australia. The approach is described by ANZLIC and is being undertaken by the Office of Spatial Policy (OSP) in the Commonwealth’s Department of Communications. Competing with each other to build the most compelling environmental app, contestants gathered at sites in three cities to bring this vision to life. The winning entry came from a pair of Brisbane-based scientists, who developed a mobile app shows what has happened to groundcover over many years. A farmer, for instance, could use the app to generate a graph of what has happened to various paddocks over the last twenty years, enabling decisions to be made about grazing, planting and fertilizing the soil. Watch Team Cover’s video below. There are masses of data about Australia held in publicly available datasets – information about geology, vegetation, water, weather, built infrastructure, transport and industry. But it is notoriously difficult to access, combine and process it all, especially given its spatial nature. For example, if we wanted to look for relationships between chronic diseases and environmental factors such as vegetation type, then this would currently be very difficult and require specialised, long-term research. Advances in big data analytics mean that new forms of analysis and data combination can be performed quickly and effectively. To enable this analysis, there needs to be ready access to and processing of this spatial data. Providing easy access to spatial data for many Australian companies, universities, governments and individuals increases the ability for Australia to innovate leading to solutions to some of Australia’s biggest problems and creation of new companies and knowledge. NICTA believes that the best way to develop a robust and useful data framework is to engage closely with the users of this data – specifically software developers working in industry and government and domain experts from universities, industry and government. There is an adage used in the open source software community of “release early, release often” which ensures that what is developed can continually be checked with its users. NICTA is therefore helping the OSP take this approach to the development of the FSDF by working with data users and using the feedback from them in improving the data framework. At the hackfest, the prototype of the first of the FSDF data themes was made available – that of Administrative Boundaries. To ensure that this FSDF data can be tried by developers in different ways, a large number of environmental data sets were featured so that attendees at the hackfest could develop applications covering a wide range of ideas. Data sets and services included those supplied by Geoscience Australia, Australian Bureau of Statistics, Bureau of Meteorology and Department of Environment and Department of Agriculture. In preparing for the hackfest, NICTA staff tried to ensure that developers could be productive within minutes (rather than the usual months) by building software tools to simplify geospatial software development by developers with no geospatial experience. These tools and sample source code were released as open source software at the hackfest. NICTA staff also converted data and provided custom data services to make it easier for developers to use. Particpants were approximately 25% industry, 25% government, 25% university and 25% NICTA. They worked together for the day to generate ideas and build software to implement these ideas. Other hackfests will be organised as data for other FSDF themes becomes ready for trialing by users. NICTA has deep expertise in data modeling, geographical data analytics and web-based 3D visualisation and has been working with OSP, CSIRO, Geoscience Australia and others on building the data models and data products for the national Foundation Spatial Data Framework. NICTA is also an advanced user of geospatial data for example in its projects on geothermal data fusion, groundwater modeling and web-based 3D geospatial visualisation. This allows NICTA to continually consider the suitability of the data models and formats for use in new online geospatial services.